The freshly applied paint to new canvas is now dry and my new limited edition prints ready for their debut display this weekend. I am really excited about the new Carousel horse and pigeon prints. I was initially skeptical if the printing techniques would capture the neon luminescence of the pigeons and the reflections in the gilding on the carousels but I have been happily proved wrong. The carousel prints have been scaled down from the original paintings too so will not require a horse box to transport. 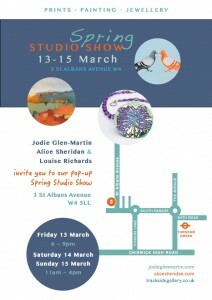 More details to follow on my website soon but if you want a preview then come to 3 St. Albans Avenue, W4 this weekend. I will be there all 3 days.